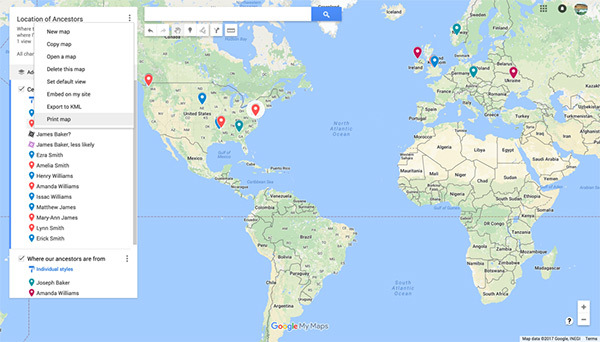 This is the first of a three-part series exploring how to use Google Maps and other apps on genealogy research trips. Read part two and part three. 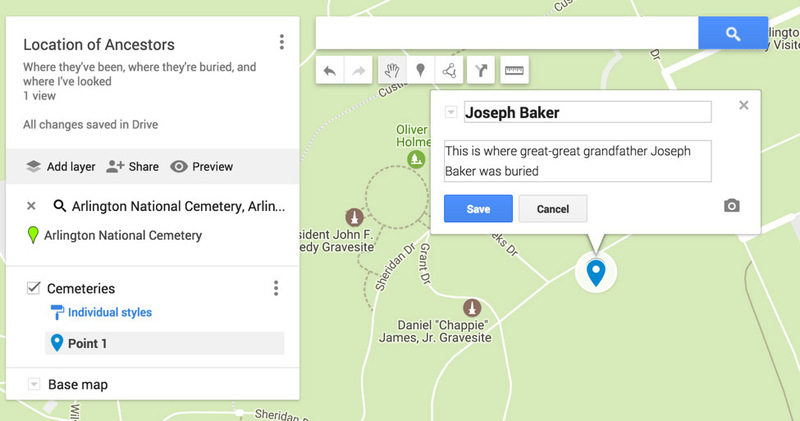 Have you ever traveled to an ancestor’s grave? Do you know the areas where your ancestors grew up? Do you keep track of all those cities and coordinates in an Excel file or tucked away in a notebook? One of the free sites he talks about is Google Maps. While you may think the site is just for travelers, we genealogists can also use it for genealogical purposes. 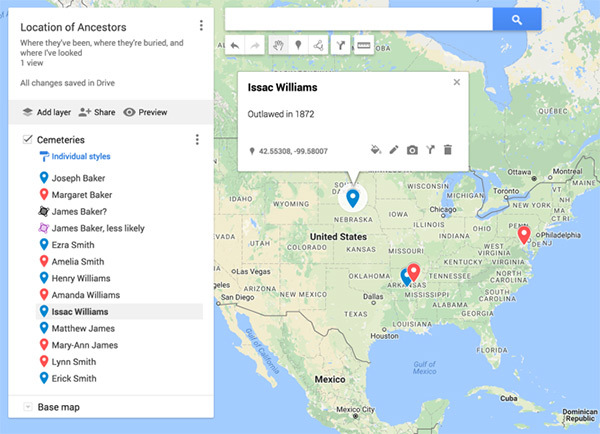 You can track all types of locations in connection with your ancestors. 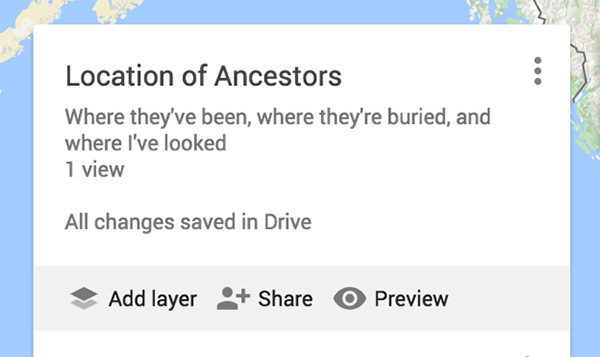 You can set up a road trip to your next ancestor-related trip. 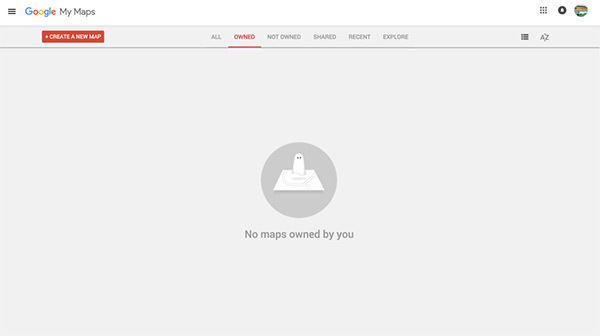 You can share the map information with your family. So how do you get started using it? 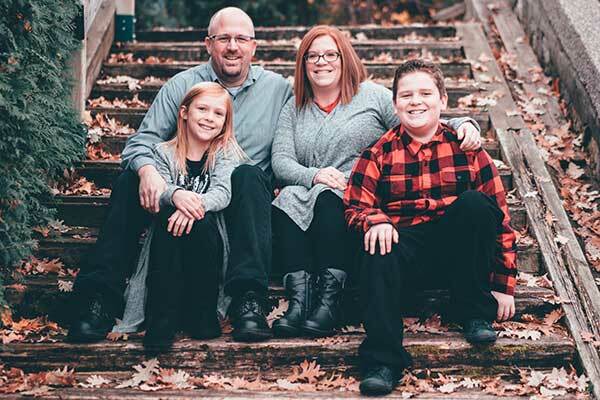 To begin, you’ll need a Google account, meaning a Gmail account or another account that you’ve created to connect with Google. 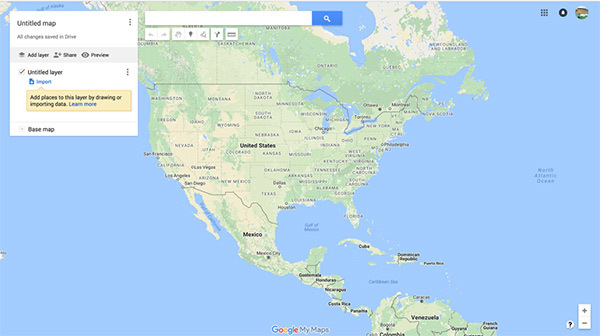 Once you’ve created an account, go to google.com/mymaps, and click Create a New Map in the top left corner. 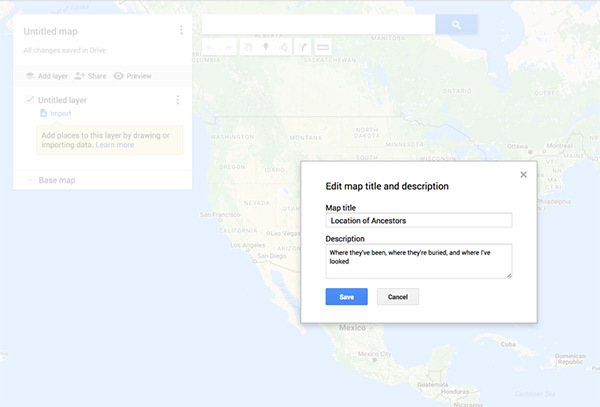 Click on Untitled map in the top left corner, rename your map, and click Save. 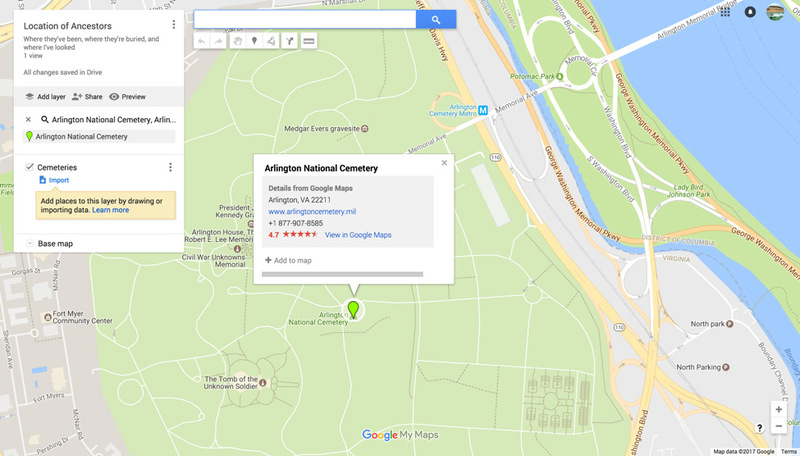 Google offers a way to help you organize your map by adding different layers. 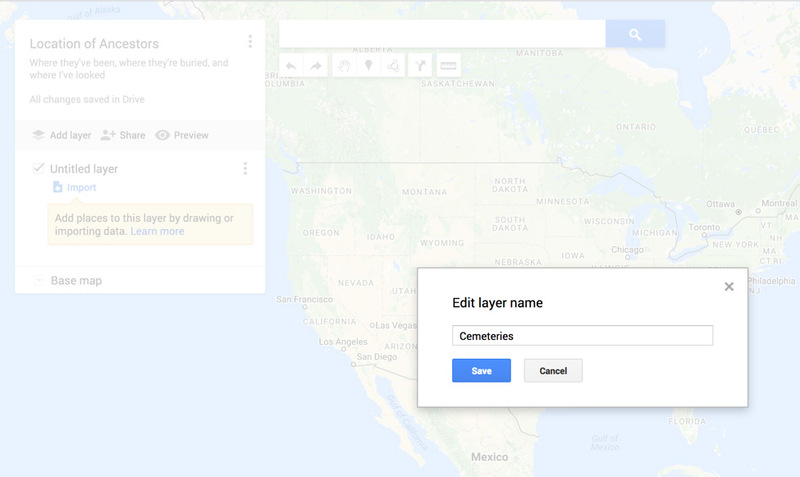 If you want to track your ancestor’s cemeteries’, you can have a layer titled “Cemeteries.” If you want to track where your ancestors are from, you can add another layer to your map and title it “Where Our Ancestors Are From.” Each layer you add can perform a different function, from tracking locations to getting directions from one point of the map to another. You can also rename layers on the same map, depending on your needs. After you’ve named your map, zoom in. 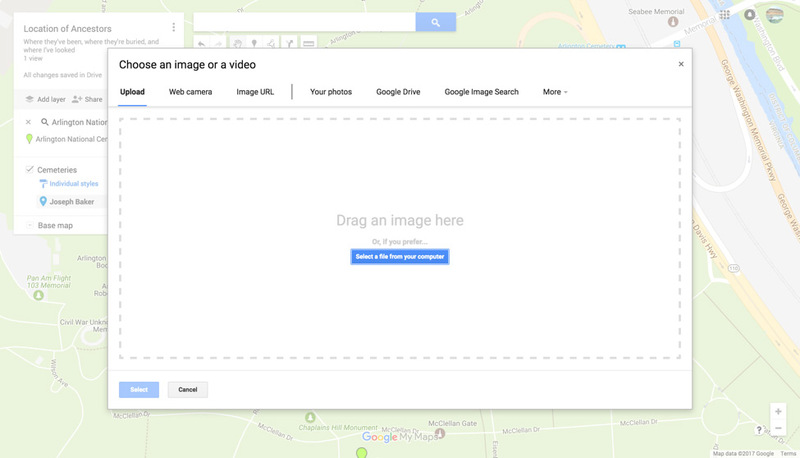 (Double-click the map or use the + and — buttons on the bottom to zoom in and out.) You can also search in the search bar at the top for locations. Notice that the location marker (the bright green balloon) takes you to exactly where you’ve searched. This does not mean that your location is saved, so you’ll want to add your own marker by pressing the location marker button under the search bar. The camera icon is one option. 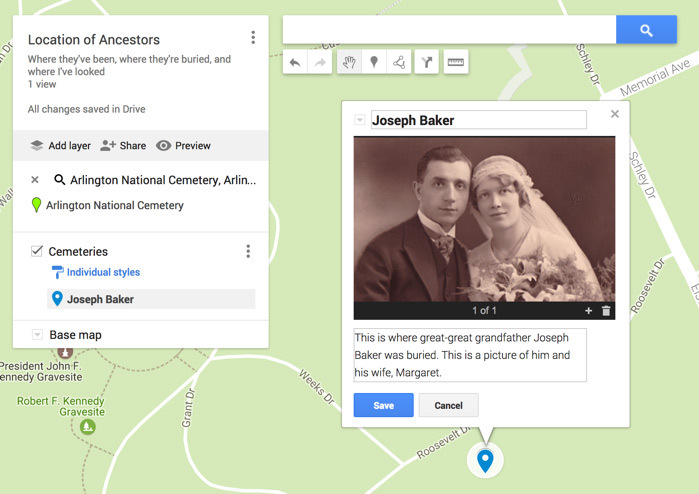 This allows you to attach an image related to your ancestor at this location. Click Select a file from your computer, pick the image you want to upload, add a description, and click Save. If you want to differentiate location markers by type or person, you can click on the paint bucket icon to change the color of the marker. 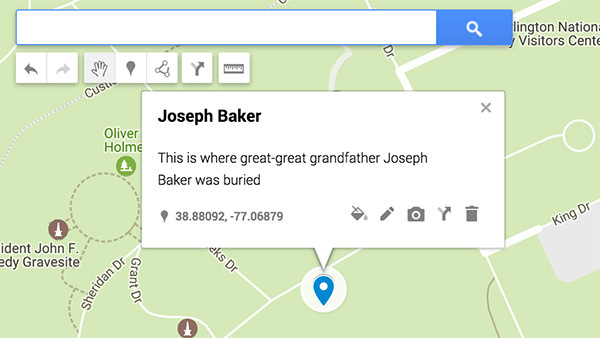 This allows you to track different people and types of locations based on the colors you’ve attached to the markers. Another option is to add lines and shapes throughout your area. Adding lines and shapes can highlight areas for many reasons. 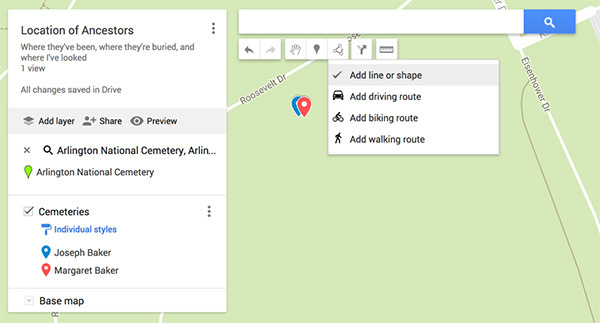 Perhaps it shows places you’ve searched for something like a grave or a homestead or places that you want to focus on searching. You can use the paint bucket to change colors of the different areas, double clicking on the last circle to finalize your shape. You have the option to click on each marker and read what’s been written about them. 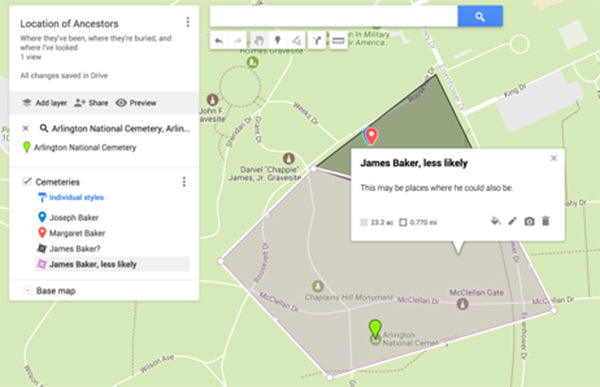 Once you have more information about a person, you can add another layer to show where they were buried or where they grew up. On layers, you have the option again to change the colors using the paint bucket icon so you can keep track of what the different points mean. 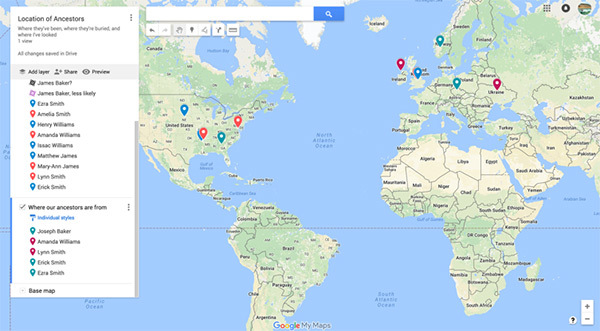 From here you can print out your family map and give it to family members as a gift by clicking on the vertical dots in the top right corner of your map chart. 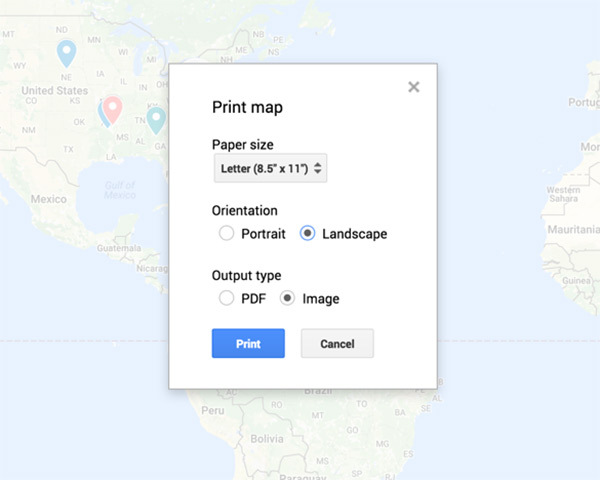 You can print the map with the paper size and orientation you like. 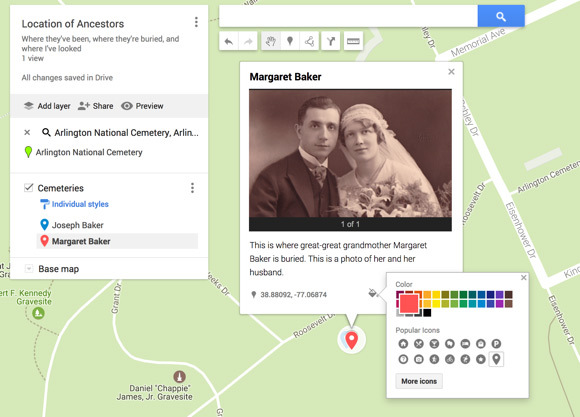 This allows your family to have a visual representation of where your ancestors came from. Now you get to plan out how to get to some of those sites! 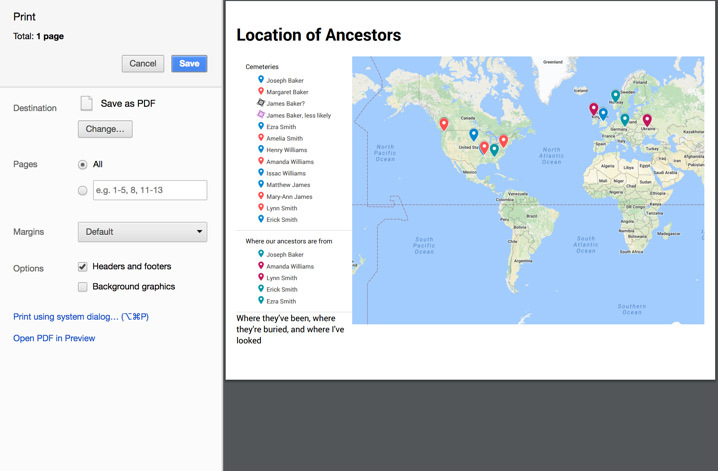 Stay tuned for part two: Maps for Genealogists: Tracking Before You Go. 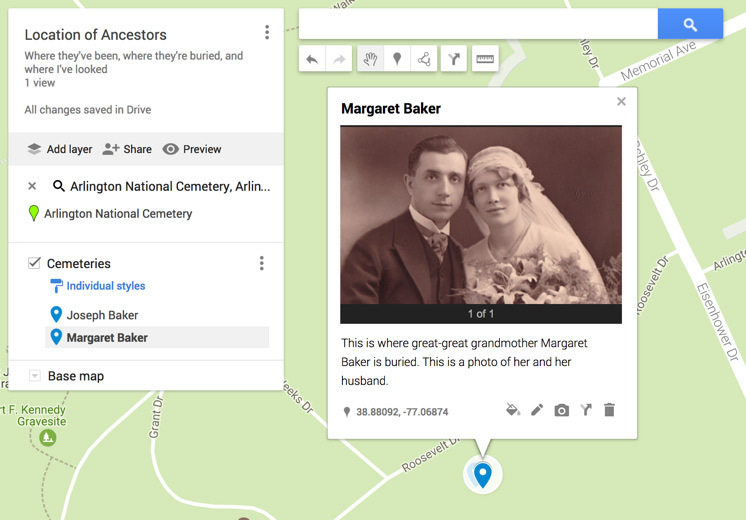 Have you used Google Maps for genealogy? 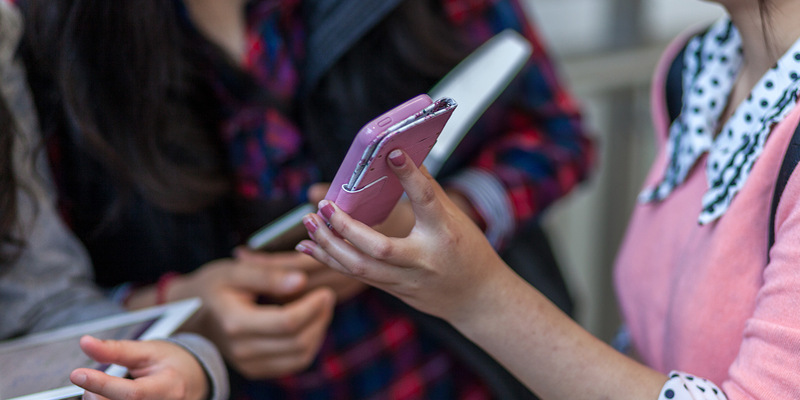 Tweet us your story @RootsTechConf.